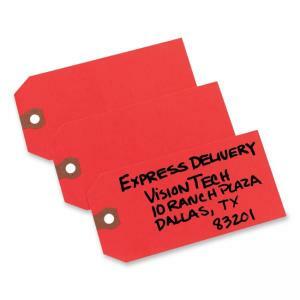 Unstrung shipping tags are strong in both construction and color. Their bright hue stands out to make it simple to locate shipping information and is light enough to make the information easily legible. A reinforced hole provides extra strength so the tag doesn't rip free of its fastening during shipment. Each tag comes unstrung to allow you to fasten it using your preferred means of attachment, whether string, wire, plastic or another method.